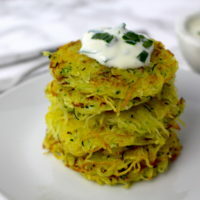 With this easy basic recipe for vegan potato fritters / potato pancakes, or whatever you like to call them, you can prepare good traditional German fare to your taste. I love having potato fritters with apple sauce, which brings back childhood memories, and then leave out the onion (which is a matter of taste, though). However, when I make them with a hearty taste and serve them with herb soy yoghurt, I like to add some more spices and herbs. Next to potatoes, you can also shred zucchini or pumpkin to fry in a pan. I had to make use of a zucchini before I went out of town for a few days, and simply mixed it in the shredded potatoes. With this basic recipe you can make vegan potato fritters with few ingredients in next to no time. 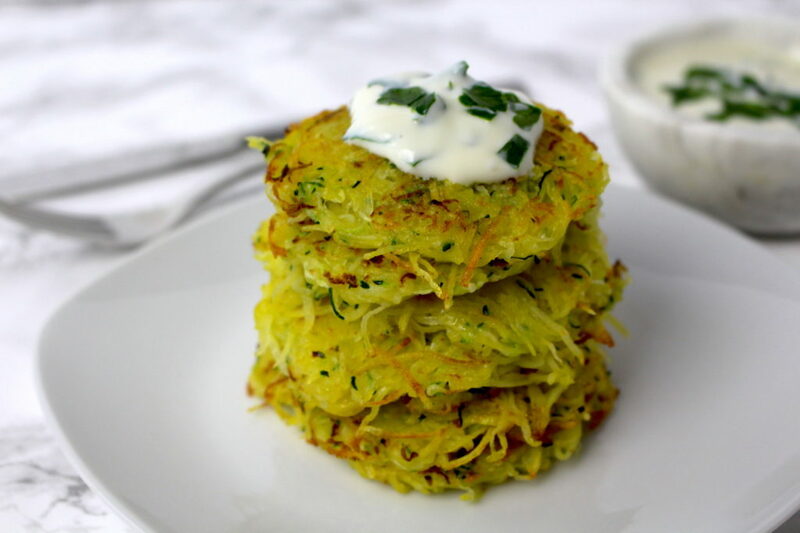 These potato pancakes taste great sweet and savory. Shred potatoes and other vegetables and onion (if using). Spread onto a clean kitchen towel, sprinkle with salt and let sit for a minute. Wring out vegetables in the kitchen towel, pressing out as much moisture as possible. Place shredded veggies in a large bowl, add spices and herbs and mix to combine. Scoop a small portion of fritter batter onto the pan and flatten to an even layer, using a spatula. Cook on both sides until golden brown (2-3 minutes). Place fritter on a paper towel to get rid of excess fat. Repeat with the remaining fritters. Serve warm topped with apple sauce or herb yoghurt. Apple sauce with only apples as ingredients is obviously healthier than one also including sugar. You can make it yourself by cooking (peeled) apples until they’re soft and mashing them up. I hope you love this recipe – please let me know in the comment section below! If you make these vegan potato fritters, make sure to take a photo and share it on my Facebook page or on Instagram, using the hashtag #minamadefood. Oh and don’t forget to tag me (@thisisminamade) so that I can see your creations!